After a spindle repair, or in the case of a new spindle manufactured a testing and break-in period is required, especially for grease lubricated spindles. So what happens during spindle break-in? We have heard this question asked now and again in CNC-related communities on the world wide web and would like to provide some clarity for our friends in the industry. Thixotropic, tribology and other such words will be avoided in favor of more common language! The lubricating component of any grease is oil, in the case of high speed spindle grease, a barium or lithium soap emulsification gives the grease it’s high viscosity that allows it to remain in place, as opposed to oil alone that will go wherever gravity takes it. 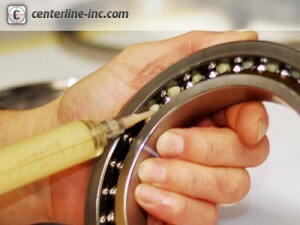 During spindle assembly roughly 30% of a bearing’s internal free space is filled with grease as evenly as possible. Even this relatively small amount of grease (as compared to a “packed” trailer bearing) is enough to cause “churning” and a rise in temperature until the viscous mass is displaced by the rolling elements. In general, the spindle break-in procedure runs the spindle at 10% of it’s maximum speed to start while temperature and vibration is monitored. Rolling elements are churning and displacing the grease and the temperature will rise and then fall as the amount of grease is decreased in the ball path. When the temperature has stabilized the speed is increased by 10% and the monitoring, stabilizing and speed-up is repeated until the spindle is run up to it’s maximum RPM successfully. Each incremental increase in speed increases the centrifugal forces in the bearing which in turn causes the rolling elements to change their ball path and again displace grease. This accounts for the rise and fall of temperatures through the break-in procedure and speed range.